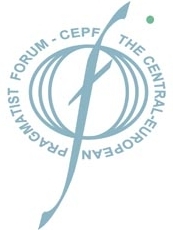 Welcome to Pragmatism Today (PT), the online journal of the Central-European Pragmatist Forum (CEPF). Pragmatism Today is an online peer-reviewed journal established on the occasion of the 10th anniversary of the CEPF in June 2010. Pragmatism Today is accessible online via its own website www.pragmatismtoday.eu or via the link through the CEPF website www.cepf.sk. Pragmatism Today thus joins the network of pragmatist-oriented journals such as The Journal of Speculative Philosophy (www.psupress.org/journals), Transactions of the Charles S. Peirce Society (www.peircesociety.org/transactions), Contemporary Pragmatism (contemporary.pragmatism.org), European Journal of Pragmatism and American Philosophy (journalofpragmatism.eu), and perhaps also some others. Via these media, pragmatists all over the globe are creating an international network for their transactions and collaboration as well as communication of their thoughts and ideas. Pluralism, creative collaboration and communication are among those cherished values that most guide the actions of pragmatists. The launching of Pragmatism Today reflects ten years of experience of the CEPF as an international network of philosophers and other scholars devoted to studies in both the history of pragmatism and its contemporary developments within the broad cultural, social and historical contexts. Pragmatism Today intends to be a medium and a forum for further studies of the pragmatist tradition in philosophy as well as an attempt to develop current pragmatist perspectives. In particular, Pragmatism Today will explore the potential of pragmatist philosophy within European and Central-European contexts in its exchanges with European philosophical schools. Pragmatism Today will focus on Central-Europe, Eastern Europe and Europe, but not exclusively. Pragmatism Today is published twice a year as summer and winter issues (until this policy is developed further into quarterly including the standard printed version of the journal). Pragmatism Today publishes original papers and essays in all genres of philosophical works, discussions and dialogues, interviews, conference and research reports, invited symposia, and other material. Special focus is on contributions devoted to an exchange between pragmatism and other traditional or contemporary European schools of thought, research in non-American roots of pragmatism, and the like. A specific section is devoted to book review essays with its critical reading of a host of contemporary works being published within the pragmatist mode. Pragmatism Today invites authors from Central Europe, Eastern Europe and Europe, but not exclusively, to enter the conversation not only on pragmatist philosophy, its history and contemporary developments, but also on all kind of relevant issues (philosophical, cultural, social, interdisciplinary, etc.) as seen from pragmatist perspectives.